Image Credit MarketingFAQ.net ~ Click image to read Who are evangelists & what do they do? Market research led to one of the oldest concepts in marketing: The Rule of Seven which states that most will not take action until they have seen your message at least seven times. That still holds true today and the busier your target audience is the less likely they are to act – unless someone they know and trust consistently recommends you. The more complex your offering the more true this is. Busy people usually only take action when someone they personally interact with regularly encourages them to invest their time in doing so. Your brand advocate can also also provide tech support, write tutorials with screen captures, and use their existing connections to identify other influencers to promote your brand. Brand evangelism can be a low cost way small businesses, non-profits and good causes can keep what they have to offer in front of their target audience without the expense of buying advertising – and direct recommendations are more effective. The best evangelist for your brand is someone with influence with your potential buyers. An even better, but sometimes overlooked type of evangelist is someone who can INFLUENCE the influencers in your niche. That is where GrowMap focuses: on building relationships with influential bloggers. We collaborate, share expertise, select the very best solutions, products and services, and then collectively and consistently promote them. We create pillar content and set up alerts to ensure that whenever someone is searching for what you have to offer we can recommend you to them right when they are most interested. Do you know of a brand that belongs in this list? Let me know! Universal Business Listings @UBLorg – EVERY business should claim their FREE ADVERTISING on major local directories including Google Places, Yahoo! Local, Bing, SuperPages, etc. AND get into the major databases that feed cell phone and GPS systems. Knowem @Knowem – Every brand needs to protect their social media usernames NOW! Volusion @Volusion – One of the very best ecommerce solutions available. Do you have recommendations of others who belong in this list? Let me know! APC @APCNorthAmerica @APCAV @SchneiderNA ~ best known for their Uninterruptible Power Supplies (UPS) – EVERY computer user would benefit from one ESPECIALLY BLOGGERS – If you can’t afford a large one at least get one to protect your tower or laptop from most damage. These brands are proof that you CAN still sell a quality product instead of cheap junk that fills up landfills and wastes precious resources! Snapper Mowers – the brand that refused to compromise on quality and one of the smart brands that said NO! to Wal-Mart. Does YOUR BRAND belong here? Let me know! We will only consider evangelizing for brands we sincerely believe in and whose solutions, products and services we actually use. These are also the only advertisers we accept on GrowMap. See our Advertising Rates. DISCLAIMER: At the time brands are added to this page they are not existing clients; however, my intention is to work with any of these who are interested. I will add those that have compensated me in any way to my official disclosure page. Each new post on GrowMap is tweeted by at least two dozen social media savvy influential bloggers. You can see GrowMap’s Twitter reach using Topsy. Typical retweet per post volume is 45-100+ which can be seen by using Topsy to see Retweets by URL. GrowMap and twelve of our closest collaborators were among 32 bloggers singled out in a joint Cornell University / Yahoo! Research study of Influencers on Twitter. This Social Media Influencers List on PeerIndex includes many of our regular collaborators. Have questions or ready to get started? Use our contact information to reach us. Thanks for the valuable information! Bookmarked! These are the things I need to learn and share with my tribe-mates! It is early days still. Although big brands have been paying for sponsored reviews for years now, very few understand brand evangelism. It could most benefit small businesses if they and the bloggers better understood how to use it well. People will evangelize indirectly in social media. This is the platform where they will espouse the values of a brand or an experience. It’s sort of indirect as the brand doesn’t attempt to instigate – which comes off phony. But it is another reason to pay more attn to social marketing. I agree that the local dollar spent is the best dollar for the community. When corporations displace local stores and they leave, they are killing the community. Even in larger cities, the local stores need and deserve our support. 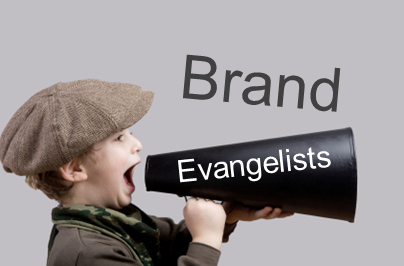 The brand evangelist is a great asset! What businessman wouldn’t want an influential person steering the consumers in his/her direction? As a blogger, working with dedicated evangelists is a dream of mine! While the rule of 7 was tried and true in the olden days of marketing, I think it’s old-hat in the age of the Web and social media. Nowadays, people turn to their friends and family and make buying decisions based on their experiences. If a couple of bad experiences are reported, the chances of any marketing message or brand ambassador having an impact is slim to none. In the end, brands are going to have to take a clos look at their products and services to make sure they are valuable to the consumer. Rule 1 in the age of the empowered consumer is to have a good product. Without it…forget it. I agree that if friends and family make recommendations they carry more influence than ads or other views. But the bottom line is that people don’t act until they see something repeatedly and that holds true online or off. Brands are facing a challenge they never had before and probably really don’t like: that consumers can avoid their bad products based on online reviews and social networks and email making it easier to solicit input and more discussion prior to purchase. That doesn’t matter to me because I firmly believe we should spend every penny we can with independent small businesses and take every penny we can away from multi-national corporate brands. I explained why in my post that covers the impact of local spending on the economy. Although the rule of seven is old it doesn’t mean that it is outdated. It still works at the present time and will remain as one of the fundamentals of marketing. Yes – but THAT is the fallacy of word of mouth marketing. Most customers WILL NOT evangelize. They simply will not. Most people are passive consumers of what streams by them and do NOT even retweet as simple as that is! There is ample proof of this. Even when people love a company or product how often do they bother to write a review or recommendation versus how many will complain? The reviews and recommendations are written by people like US not the general public. How many readers do you have compared to how many who comment regularly or even EVER comment? Anyone who is waiting for their customers to be their best evangelists is going to be sorely disappointed unless they can find some REALLY creative way to get them to share – like having an exceptional video they will pass along. For most brands that is NOT going to work. It just won’t. And the sooner they realize that and start doing what will, the sooner they can start doing what they MUST do to survive. The economy is NOT going to get better. It can’t because the value of the dollar is going to keep going down so even if everyone had the same good paying job they always had they will have less and less to spend – or worse – will take on debt that will really hurt them. The solution is supporting small businesses, creating strong local communities, and taking every possible penny away from the multi-national corporations and banks that are destroying our economy – and economies around the world – intentionally. Fiat currencies ALWAYS result in creating “money” out of thin air that created debt that results in printing more and more money (or creating it in computers or ledgers) which causes inflation which WILL inevitably be followed by ecpnomic collapse. ALWAYS. Nothing else can possibly happen. That is why there are now people willing to speak out. They can see the bridge is out and the train is about to hurtle off the cliff and the wise ones are going to GET OFF before it is too late. We all have to raise awareness until others recognize what is important. The sooner they start making changes the better they will be able to weather the declining economy. Time if of the essence because what we can find is being manipulated in search engines, dissenting opinions are being pushed down in the serps, and alternative voices are harder than ever to find. It took me two to third times longer to find supporting links for my Food Rights post and I was searching specifically for both the subject AND the answers I wanted to find. Eventually we may not be able to find them at all because Google has already announced they will use Chrome Block data and page load speeds as excuses to lower search positions or even delete sites from the index. The faster I can get these huge blogging collaborations built – especially the ones that are location based – the sooner we can spread the word about why we should be supporting these great brands. What I need is for some of these brands to support my efforts so that I can focus on the niches and locations most important to them while simultaneously researching, identifying and getting the best blogs on board and collaborating. There is so much to do that whichever brands will support my efforts will get their collaborations built first – and for far less than they can even imagine in terms of money invested – resulting in ever-growing long term results. I love the idea of finding the people who influence the influencers and developing relationships with them. Its like going the extra mile in brand evangelism. Great post! only look for brand not the quality but the wise customer look for brand and quality. Becca would love you to read ..Hello world! Thank for the article! It’s completely true. Brand value is always important for business. If we can maintain the good relationships with costumer, we’ll get more profits. Just like any business, success in the online and offline world is based on relationships. Make some good ones, and your profits will soar. I’ll just have to try to incorporate these ideas into my business – thanks for making me think. I really like this idea of finding a “brand evangelist” and I will definitely be putting some time and effort into this idea with my business. Thanks, great article. I went through your Rule of Seven and this quite profitable in promoting your brand. Because every business want to make their brand in top list and for this your points are quite helpful. Generally, people tend to chose product which is tested for ages. It’s safe and trusted. But some people who loves varieties and loves exploring the world and sick of the same old stuff, the go some research and grab whatever they wanted. Well I have to agree with that! Many people prefer to chose those items and products that have been established and tested for quite a period of time. Yah i agree with george.Everyone know’s that brand value is very important for every business.mostly client goes with a good brand. Creating a brand is all about gaining and trust and authority from a user which would provide a potential boost for any business on a longer run. But we may need to be patience, plan and execute numerous ideas one after another. In my opinion, having a brand gives the idea of safety. If a client sees that the business is a brand, it gives him confidence and it’s trust-worthy. I myself would go for a brand, as always. Brands are powerful businesses, at least generally speaking, and a powerful business will never risk to disappoint a customer, that’s why they’re always the best and have only quality products. So true, brand is a way to make you trustworthy online. It’s a good thing but really, it’s difficult to build your brand online. It’s my first time to hear about evangelist brand, complicated.